Does steam cleaning outperform vacuuming? Most people have the idea that they can keep their carpets clean on their own and that there is no need to call a professional. They vacuum regularly and blot out stains when the need arises and assume they are adequately protecting their carpets. However, what a lot of people don’t know is that carpet companies require that the carpet receive professional steam cleaning every 12 to 24 months in order for their warranty to remain valid, and since carpets are not designed to last forever that warranty is something that you definitely want to keep valid. Unfortunately, vacuuming carpets is just simply not enough. Even steam cleaning the carpets yourself is not enough. Most warranties require that the service is performed by a professional steam cleaner. So legally speaking, professional steam cleaning is the only way to ensure the longevity of your carpet. Not only is steam cleaning good for your carpet, but it’s great for your health too. professionals say that indoor air quality can be up to ten times worse than outdoor air quality if proper precautions, like steam cleaning, are not taken. With so many people suffering from indoor allergies air quality is a top concern. Since most carpet companies require your carpets to be professionally steamed every 12 to 24 months it is important you steam clean at least this often. However, we recommend even more often in the interest of a dust-free home. We recommend a professional steam cleaning every 6 months, or every 4 to 6 WEEKS if you own pets. Regardless of how often you choose to have your carpets steam cleaned it is imperative that you do so for the life of your carpets and health of your family and pets. Does steam cleaning myself have the same results as a professional steam cleaning company? We do not recommend attempting to steam clean carpets yourself. For one, most carpet companies don’t count this for their warranties, and two, only professional steam cleaning machines are able to really zap the moisture once the cleaning is finished. When you steam clean yourself you set up a perfect environment for mold and bacteria to grow as moisture often collects underneath the carpet, but a professional steamer has the power to truly dry the carpets after the cleaning is finished. You should vacuum between steams, starting at once a week or more if you have pets, to see best results. Vacuuming allows you to capture dust particles and soil before it has a chance to sink down deep into the carpet fibers. 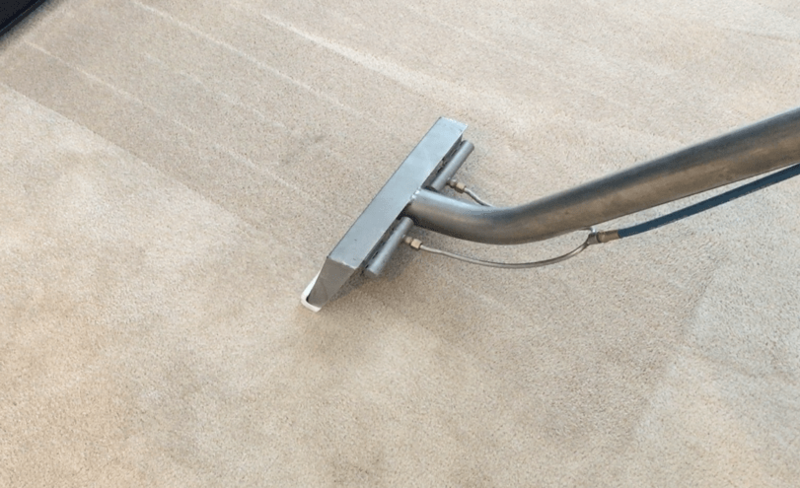 The more often you vacuum the less chance soil has to sink deep into your carpets. We recommend vacuuming slow as that allows the vacuum to properly do its job of vibrating the carpet fibers and capturing the dust particles. When you vacuum fast you only collect what sits on the very surface and don’t get the dust particles sitting in the fibers that cause allergies. Rugs should be vacuumed at the same frequency as carpet, as well as a deep cleaning every 6 months. You can steam clean them once a year, and give them a broom beating outside every 6 months. After a deep cleaning, we recommend leaving them outside to air out for 24 hours. This gives it another chance to air out all the dust particles and allergens. Whenever you have a spill on your carpet it is important that you blot it immediately. Allowing it to sit without treatment gives the moisture time to seep deep into the carpet and make it far more difficult to get out.